Previous research work on the ergogenic effects of music has mainly involved constant power tests to exhaustion as dependent variables. Time trials are more externally valid than constant power tests, may be more reliable and allow the distribution of self-selected work-rate to be explored. We examined whether music improved starting, finishing and/or overall power during a 10-km cycling time trial, and whether heart rate and subjective responses to this time trial were altered by music. Sixteen participants performed two 10-km time trials on a Cybex cycle ergometer with, and without, the presence of a form of dance music known as “trance” (tempo = 142 beats × min-1, volume at ear = 87 dB). Participants also completed the Brunel music rating inventory (BMRI) after each time trial in the music condition. The mean ± SD time to complete the time trial was 1030 ± 79 s in the music condition compared to 1052 ± 77 s without music (95 % CI of difference = 10 to 34 s, p = 0.001). Nevertheless, ratings of perceived exertion were consistently (0.8 units) higher throughout the time trial with music (p < 0.0005). The interaction between distance and condition was significant for cycling speed measured during the time trial (p = 0.007). The largest music-induced increases in cycling speed and heart rate were observed in the first 3 km of the time trial. After completion of the BMRI, participants rated the “tempo” and “rhythm” of the music as more motivating than the “harmony” and “melody” aspects. These results suggest that music improves cycling speed mostly in the first few minutes of a 10-km time trial. 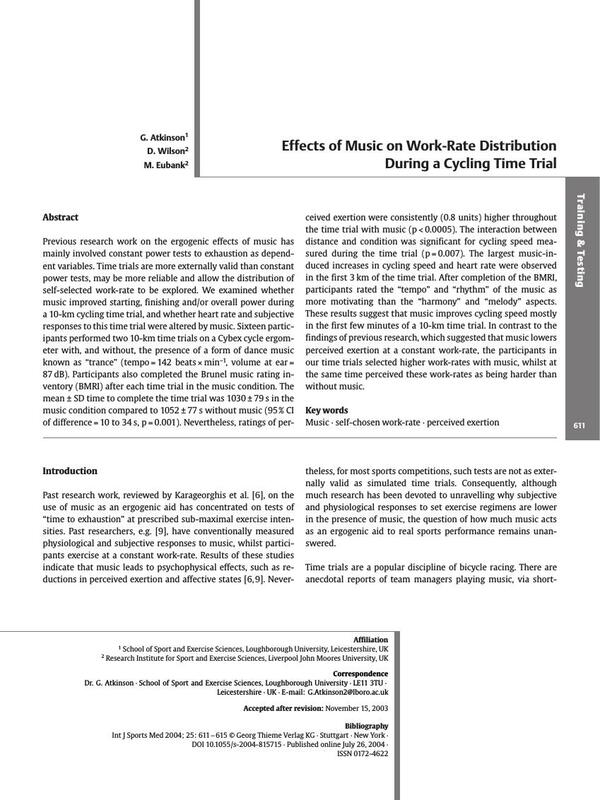 In contrast to the findings of previous research, which suggested that music lowers perceived exertion at a constant work-rate, the participants in our time trials selected higher work-rates with music, whilst at the same time perceived these work-rates as being harder than without music.